The Bridges of Madison County was turned into a movie and a play. Author Robert James Waller has donated an original manuscript from his book “The Bridges of Madison County” to the University of Northern Iowa’s Rod Library. Waller was a professor and former dean at UNI before the publishing of the book in 1992 vaulted him into the international spotlight. Special collections librarian, Gerald Petersen, says the donation is a key piece in process of creating Waller’s first novel. He says it’s a very late typescript that was written on the computer, but includes Waller’s hand-written notes for changes. 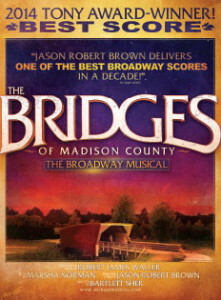 “The Bridges of Madison County” featured an Iowa farm wife who had an affair with a photographer. It was a New York Times bestseller that has sold 50 million copies worldwide, and was later made into a movie and then a Broadway musical. Petersen says interest remains in the story. “We still do get questions — certainly not at the level we were getting say in the early 90s,” according to Petersen. “At that time, you almost couldn’t open a newspaper or a magazine or listen to something on the radio or watch something on television without getting a very clear reference to Bridges of Madison County.” He says the interest in Waller has changed. Petersen says the “real acute interest” has gone away and people are starting to take more serious look Waller’s work, as Waller has written more novels and many nonfiction pieces. “So, people will begin to be interested I think more in his body of work, rather than just Bridges,” Petersen says. The donated manuscript will be available for those who are interested. He says it will be in the Special Collections and University Archives Research Room for anyone who wants to take a look at it or do research. Petersen says “The Bridges of Madison County” is a great story in itself of how someone can hit upon a story that captures readers.”I think an awful lot of us would think ‘I can sit down and write a book if I really just had the time.’ And they forget about having the idea and having the skills and things like that. Professor Waller had all the requisite things, he was ready to go,” Petersen says. “…one way or the other, he sat down and he wrote a book that was about as successful as anything you can think of in American publishing history,” Petersen says. And he not only wrote the book, he found a way to get it published. “You can be real, real happy with what you have just written — but so what if you can’t put it in front of other people. Professor Waller persisted and put it in front of other people,” Petersen says. Waller now lives in Texas. For more information about the Bridges manuscript, visit: www.library.uni.edu.